Each sleeve contains eight rolls of 1,750 labels per roll and one ink roller. 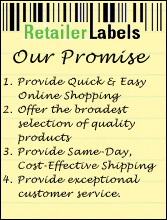 You receive 14,000 labels per sleeve. When you need date and time coding this is the two line model for your needs, both top and bottom lines have up to 8 print positions.